With his dense coat of brown curls, the Irish Water Spaniel cuts a striking figure in the field and on the sidewalk. The largest of the spaniels—and one of the oldest—the IWS is covered in liver-hued curls, except on his face and distinctive 'rat tail.' A mop of loose curls on his head gives him a happy-go-lucky appearance, which is matched by his merry personality. The Irish Water Spaniel developed in the breed's namesake country as a gun dog skilled at retrieving quarry from the water using his outstanding swimming skills. In the field, he sets all silliness aside and is hardworking and focused. A family willing and able to play and exercise with their IWS is a must—this is an energetic breed that thrives when kept busy. The strong-willed, sometimes skittish Irish Water Spaniel also flourishes with a confident owner with experience socializing and training dogs. The Irish Water Spaniel (IWS) was once also known as the Whip-Tail Spaniel, the Rat-Tail Spaniel, and the Shannon Spaniel. Coat – The Irish Water Spaniel has a dense, water-repellent coat of tight curls covering most of his body, including down his legs and on his feet. The topknot of curls on his head is somewhat looser than the hair on the rest of his body, giving him a rakish quality. The fur is straight and short on his face, under his throat, and on his tail. The coat color is liver—from rich liver to very dark liver with a hint of purple (known as puce liver). Irish Water Spaniels are sturdy, strong-boned dogs with a rectangular profile. They are muscular from the arched neck to the powerful hindquarters. The breed has a proud, spirited stance, and a precise, slightly rolling stride. Their low-set ears are long and covered in abundant loose curls, and their brown eyes have an always curious and alert expression. The Irish Water Spaniel disposition mixes steadfastness with a fun-loving sense of humor. Stories of a curly-coated water spaniel from Ireland date back to the Middle Ages, but the earliest origins of the Irish Water Spaniel are unclear. A single dog named Boatswain, however, is recognized as the father of the modern IWS line. Boatswain was born in the early 1800s in the kennel of Justin McCarthy, who never revealed which dog types contributed to the breed. Some guesses include Poodles and Portuguese Water Dogs, but the truth remains a mystery. The American Kennel Club recognized the Irish Water Spaniel in 1878. These spirited dogs have a rollicking good time—and so does anyone who spends time with them. Irish Water Spaniels are playful and energetic, with an alert and curious demeanor. They can be aloof with strangers, but this shouldn't turn towards aggression. Though loyal and eager to please, the IWS has an independent streak that makes him best matched with confident owners who have dog training experience. Are Irish Water Spaniels Good with Kids? Irish Water Spaniels get on swimmingly with kids with whom they're raised, though they are ideally matched with older kids who can hold their own when play gets boisterous. Are Irish Water Spaniels Good with Other Pets? The IWS may coexist peacefully around dogs with whom he's raised from an early age, but he doesn't usually play nicely with dogs he doesn't know—steer wide of the dog park. With their strong prey drive, Irish Water Spaniels aren't safe roomies for cats and small animals, such as rabbits, gerbils, and hamsters. Irish Water Spaniels keep a keen eye on their territory, but they aren't known as a highly protective breed. Are Irish Water Spaniels Good Guard Dogs? The watchful IWS will bark to alert the household to the approach of friends and strangers alike. Indeed, this breed doesn't bark often, so pay heed when he makes a ruckus. He is not a strong guard dog, however, because of his welcoming nature. Irish Water Spaniels have the stamina for long days working or frolicking. Indoor Irish Water Spaniels are people dogs and should live indoors with their families. They are not suited to apartment life because of their high exercise needs and energy levels. The IWS' low-shedding coat doesn't leave much fur for you to clean, but you may need to hose him down after visiting the watering hole before going back inside. Outdoor The IWS should spend a good portion of his day outside training, playing, and exercising with his family. The Irish Water Spaniel is such an active dog, a large yard where he can play catch and bolt from end to end is beneficial. Exercise A healthy, adult Irish Water Spaniel requires one to two hours of vigorous physical activity each day. Playing fetch in the water is a favorite pastime, as are dock jumping and field training. Endurance Irish Water Spaniels have the stamina for several long walks and play sessions each day. Running Miles: Irish Water Spaniels are known for their energy, but this playful breed prefers playing fetch to running for miles on end. Hiking Miles: The IWS will gladly trek alongside you for a few hours or half a day, especially if there's a watering hole along the way. Food Generally, this mid-sized breed requires 1½ to 2½ cups of good quality dry dog food each day, given in two feedings. This will vary, however, based upon your Irish Water Spaniel's activity level and age. Talk to your veterinarian about the optimal diet and quantity of food for your IWS. Alone Time If given the choice, Irish Water Spaniels would opt to be with their people at all times. But they are independent enough to spend a few hours alone each day. It's wise to crate train your IWS because they get bored easily and will resort to chewing to pass the time. The Irish Water Spaniel's curly coat requires brushing several times a week to prevent matting. Because of the protective, water-resistant oils in his coat, the IWS requires a bath only every few months. Brush your Irish Water Spaniel's teeth several times a week, and trim his nails every month or so to prevent painful cracking. Wash his ears once a week with a gentle, vet-approved cleanser to prevent infections caused by wax and dirt buildup, and water. 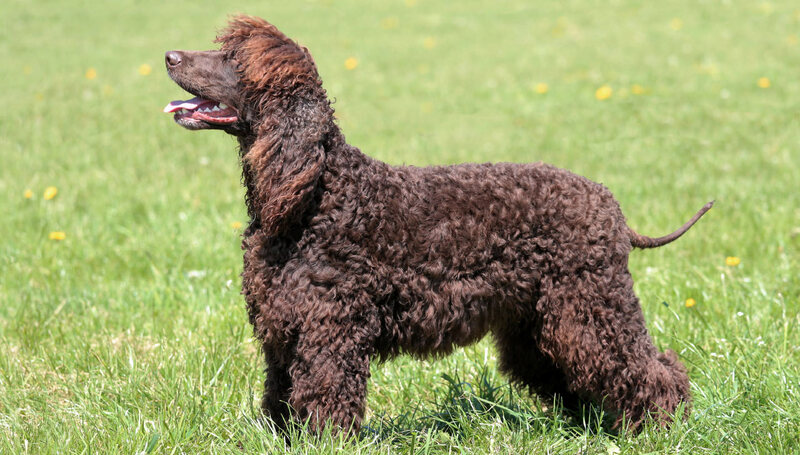 You can minimize serious health concerns in your Irish Water Spaniel by purchasing him from a reputable breeder who engages in responsible breeding practices, and through screening for common diseases and conditions. Irish Water Spaniels are people pleasers who are also very strong willed—they do best with experienced trainers who are firm, consistent, and fair from the beginning. The IWS benefits from advanced training that keeps him busy—mentally and physically. This agile breed is an excellent candidate for dock jumping, agility training, flyball, and most dog sports. Irish Water Spaniels are excellent gun dogs, especially when it comes to retrieving waterfowl. Are Irish Water Spaniels hypoallergenic? Yes. Irish Water Spaniels shed very lightly and don't create much pet dander in your home. Dander is the primary cause of most pet related allergies. Can Irish Water Spaniels swim? Irish Water Spaniels were bred to retrieve waterfowl. Their water-resistant coats help keep them dry, and they are natural swimmers. If your IRS is not on a leash when you walk near a pool or lake, he is likely to jump right into the water.